Complete the sentences and paragraphs by using the words in the box. Your teacher will read the passage out loud first, so listen carefully. After you have completed the CLOZE activity, select 10 words and create a GLOSSARY. This worksheet was created by John Bower. HOD Social Sciences at McAuley High School, Otahuhu, Auckland, New Zealand, 2018. 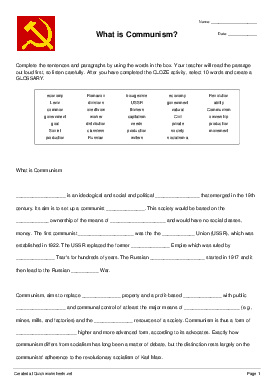 This worksheet can be used for any social studies topic on different systems of government. It relates to Level Five of the New Zealand Social Studies Curriculum. Understand how systems of government in New Zealand operate and affect people’s lives and how they compare with another system.